Although most of us have been taught from a young age the importance of maintaining healthy teeth in order to prevent cavities, one thing that’s rarely mentioned is the health of our gums. After all, the purpose of the gums is to not only support and strengthen teeth but to protect sensitive parts of the tooth and jaw from harmful bacteria. Most of us are well aware of the signs of unhealthy teeth which usually comes in the form of yellow teeth or pain coming from the tooth root. However, in this blog, we’re going to look at some of the most common signs of unhealthy gums and what causes them. 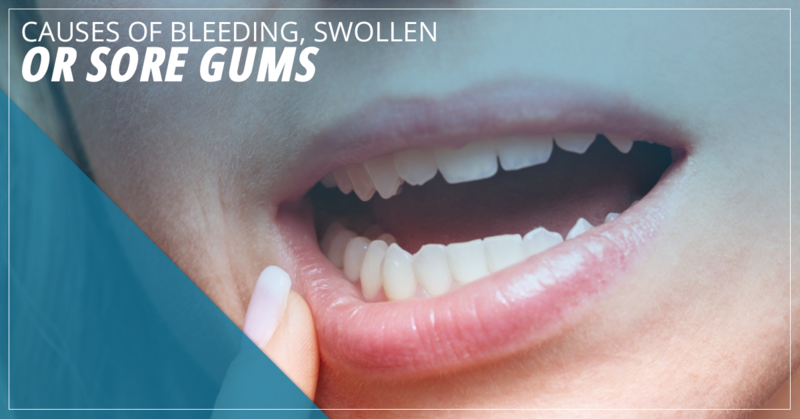 The cause of bleeding, swollen, or sore gums is almost always gingivitis. Around 75 percent of people over the age of 35 have this disease which is a less severe form of gum disease or periodontal disease. However, in old age, patients are much more likely to experience severe periodontal disease which inevitably leads to tooth loss. Anyone who’s gotten a canker sore knows how painful they can be. Even touching them with your tongue or brushing them with food can be unbearable. However, this pain is not always localized. Sometimes, the pain can radiate across the gums. Although you shouldn’t rule out the possibility of gum disease, it’s best to wait it out until the canker sore is healed before taking action. Just like tooth pain, unhealthy gums usually start with poor oral health routines. When it comes to the actual technique that you use while brushing, be sure to emphasize cleaning along the gum line rather than just the tooth. Although cleaning the tooth itself is important, most of the bacteria will be removed from your teeth from light brushing. There’s no need to brush vigorously, which can lead to the enamel wearing off of your teeth. Perhaps even more important than brushing the tooth itself is brushing along the gum line. This is where bacteria and food particles most often build up. If an infection reaches below the gum line, brushing will be ineffective and you’ll need to undergo a root scaling and planing procedure which is essentially a deep cleaning below the gum line. Equally important as your brushing technique and frequency is your flossing technique. The first rule of flossing is to do it every day. Unfortunately, many patients will only floss every couple days and wonder why their gums are sore or start bleeding afterward. This is almost certainly a sign that you haven’t been flossing well enough, often enough, or you’re flossing too vigorously. If you’re not used to flossing at all, make sure you ease yourself into it and don’t overdo it. Eventually, your gums will be used to regular flossing and they won’t bleed or get swollen. Many dentists and periodontists will provide patients with a free oral health screening and are generally trained to look out for warning signs associated with oral cancer. However, if you believe you’re experiencing one or more of the symptoms listed above, be sure to consult with your oral health specialist. Periodontists specialize in the gums and all other supporting structures of the teeth. So, if you’re experiencing swollen, sore, or bleeding gums, it’s always best to speak with your local periodontists at Same Day Implants. Our board-certified periodontists will diagnose gum conditions and provide you with the best long-term solution for your condition. In the case of a loose or missing tooth, we are happy to provide same-day implants when possible. If you have any questions or you’re ready to schedule an appointment, call us today.